Congregations come together in Downtown Pensacola to sponsor a blood drive, through One Blood. Christ Church, First United Methodist Church, The Basilica of St. Michael the Archangel, First Presbyterian Church, Temple Beth-El, Allen Chapel AME and First Baptist Church are hosting the event. One Blood will provide a Big Red Bus at two locations from 8:00 am to 1:00 pm: First United Methodist, 6 E. Wright Street, and Basilica of St. Michael's, 19 N. Palafox. Following the 10:30 service! Bring a friend and wear your casual clothes. Great food ~ Children's Bouncy House ~ Live Music ~ Live Animals! 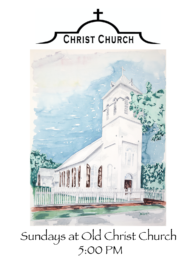 This new service at Old Christ Church will be reverent, casual, historic and convenient.